Today, Senate Republican leaders released their version of the American Health Care Act (AHCA). Without a single hearing or the typical committee process, they plan to hold a vote on this bill on the Senate floor next week. President Trump predicted the Senate bill would be “phenomenal” and less “mean” than that of the House. But does it address the major concerns about the House bill? 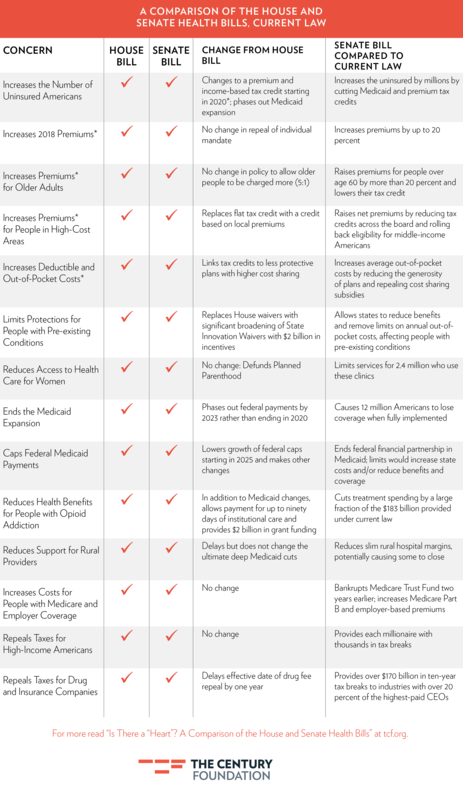 The table below compares the two bills, with the check marks indicating whether or not the concern remains relative to current law. Want the latest facts on TrumpCare and its impacts straight from the nation’s leading experts?